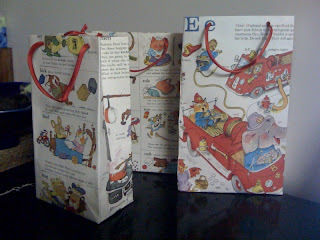 On a recent trip to Melbourne I learnt how to make these cute paper gift bags. You can use old books, wrapping paper or magazines. Here are some that I made using a Richard Scarrey children's book I bought cheap from the opp shop. * Grab a solid box that you can use to make the shape - i.e. an old metal biscuit tin or wooden box. This will designate the shape of the bag. I'm using a wooden box big enough to hold a wine bottle. * Cut the paper so it wraps around the box and glue (pva applied with a paint brush works well) the edges together. * Then fold the ends together like your wrapping a present and glue. * Pull the box out and insert a base from cardboard. I used cardboard from a cereal box. * Fold down the top and use a hole punch to place two holes on either side of the bag. 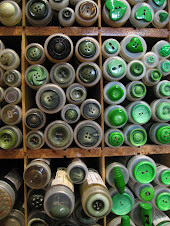 *Thread through the braid or ribbon as handles and add a tag if you like. 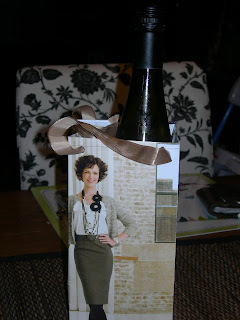 Here's my finished version of a wine gift bag made from a brochure out of the mail. Wow! this is great! I have a huge stash of these bags at home to re-use, but would love to make my own too. Yes my son loves Richard Scarrey too, the book came from my mother in law who sells them secondhand at the local market. This one happened to be scribbled on and falling apart so it has now been reused. Phew! glad it was a falling apart copy. Mind you, if my 9 month old keeps chewing at books the way she is currently, I might be able to make a Richard Scarrey bag soon too! super groovy! I am inspired to do the same. I've been making gift bags since I was a kid. I use magazine pages, used gift wrap and wall paper leftovers.